Think small car, think hatchback. But budget permitting and pragmatism be damned, there’s plenty of premium-grade choice enriching the genes and expanding the depth of the largest local car sales pool. It’s here that the Audi TT Quattro S-tronic and BMW 228i Coupe are making inimitable waves for buyers with particular tastes. You might also think neither could be further from cheap-and-cheerful, front-driven, five-door convention, though that’s not true. The higher-spec M235i sits as all the small car BMW money buys, while the S and newly outed, forthcoming RS versions of the TT do and will offer more four-ringed performance in the same package. No, our competitors here are mid-variants of their respective ranges. They’re not cheap. At $64,400 plus on-roads, the 228i Coupe wants for a $13,400 premium over the similarly turbo-four-powered 220i, though it saves $11,365 over the mighty turbo-six M235i. However, a slew of cost options, some questionable at this price point, bump our test car’s on-road cost to $72,442, including metallic paint ($1142), Advanced Parking ($1000), Visibility package ($1200), Professional infotainment ($2300) and Comfort package ($2000). That said, the eight-speed stall convertor automatic, bi xenon headlights, leather trim and variable sport steering (not fitted to lesser 2-Series models) are all standard fitment on 228i. Sport line accoutrements inside and out, too, are a no-cost option. Our Audi TT 2.0 TFSI quattro S tronic Sport, to give it its full named, starts from $77,950 plus on-roads. Sans options, the Audi wants for a cool $13,550 beyond its base 228i nemesis. For the record, Your Honour, some $3000 of that price is for the S tronic twin-clutch six-speed transmission, another $3000 for quattro all-wheel drive. Our example adds LED headlights ($2500), driver-assist-laden Assistance package ($2200) and, like the BMW, the sting of an extra ($1400) for metallic paint, for a total cost of a frosty $84,050. Big monies for small cars, though they’re distinctly different animals. Given that Audi offers an all-encompassing A3-based range, including the stove-hot upcoming RS3, the TT, then, channels its much-trumpeted design/tech/sportiness pitch with supreme force, a driver’s car for the style aficionados. It’s form and function is equal parts, though performance pretensions don’t weigh in much on either side. It’s Audi at its most unconventional, selling the ‘I don’t drive hatchbacks’ message with stylised exclamation points. The 228i couldn’t be more different in execution. That it’s so conventional a BMW format – body shape, engine placement, rear drive – is what makes it quite unique in the small car landscape and such a small-car fringe-dweller. 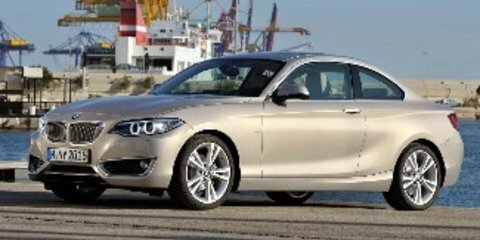 It is, in essence, a shrunken 4-Series…for those who otherwise wouldn’t be caught dead in a ‘normal’ hatchback. The polarity is such that, beyond any other attribute – be it ten-tenths driving dynamics or cup-holder count – buyers will likely favour Audi or BMW primarily on styling and the practicalities of cabin space. Emotional appeal and packaging will be deal-makers and breakers cross-shopping the splurge on this premium pair, rational critique be damned. The BMW fits four adults. The Audi most certainly can’t. At a pinch, the TT will fit one pre-teen comfortably behind the front passenger seat with it jammed forward on its rails. Both present awkward access to the second row. Child seats can be fitted in back of either car, but unless your toddlers can climb in and out themselves best shop for something with rear doors. Worth consideration, too, is that the BMW’s interior door grab handles are quite close to the door hinge, requiring excessive leverage to open or close the doors from inside. The TT’s cargo area, complete with split-foldable rear seat flexibility, is a generous 712 litres seats down, its handy lift-back tailgate design adding further utility. The BMW is rarified in offering an appealing two-door-and-a-bootlid format and while its 390-litre boot space is reasonable in volume it’s not a patch on the Audi’s luggage swallowing ability. The cabin design contrast is noticeable between Audi’s flamboyant modernism and BMW’s traditional conservatism. The TT’s swept-wing dash, hidden air-con control layout and digital Virtual Pilot instrumentation is interior new-school minimalism and it works a charm. Easy to acclimatise to, you may be convinced, as I am, that this simplified approach to vehicle interface is a minor revolution. And rivals’ proliferation of button overload may soon become passé. That said, the BMW’s user interface is neat (by premium German standards) and the current, intuitive iDrive is a widely loved system. The TT does look slicker and feel a little more ‘special’ in materials and finish than the 228i, but the timelessness of the BMW styling has huge appeal to some tastes. From the classic analogue instrumentation to the old-school handbrake, the Munich device retains a sense of convention. The 228i’s no-cost Sport Line package, as fitted, is both purposeful and comfortable, the bolstered leather seats offering better under-thigh support when adjusted low than the Audi’s leather-Alcantara buckets. The TT’s lack of footwell depth forces a less-than-natural seat positioning for some taller drivers. Despite being the patently sportier place to reside, the TT feels a case of eye-catching form dictating compromised functionality. Despite the keener entry price, the BMW’s 2.0-litre turbo four, at 180kW, offers 11 kilowatts of extra power, though the Audi turbocharged four of similar capacity hits its 169kW peak at just 4500rpm, 500rpm sooner. The TT also offers a superior 370Nm in a broad 1600-4300rpm envelope but the BMW channels 350Nm from a wider 1250-4800rpm window. Neither offers superiority in numbers, then, though Audi claims its steed’s 5.3-second march to 100km/h from a standstill is 0.4sec swifter than the BMW’s best. It’s the 228i, though, that feels patently more urgent in throttle response, at least when compared in their respective comfort drive modes – partly because peak torque arrives almost off idle, partly due to the short first ratio of eight available forward speeds. Such urgency under foot can be satisfying…when not in peak-hour crawl staring into the tail of a flat-bad truck. 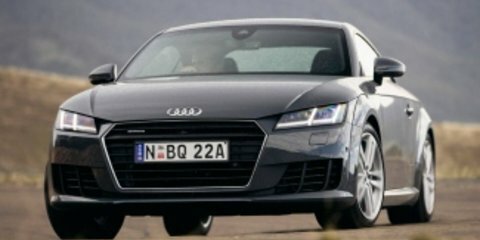 The more progressive nature of the TT’s throttle makes it easier to drive around town, though its own comfort mode can be a little lazy on the S tronic’s upshifts. Both cars offer eco-tuned and go-faster drive modes – the BMW has both Sport and Sport Plus – though only the TT offers an Individual mode to tailor vehicular settings to suit the driver’s whims. If only there was a sweeter middling setting for ‘Engine/Gearbox’ between its lazy ‘comfort’ and aggressive ‘dynamic’ calibrations. The Audi’s engine feels more energetic in the top-end; the BMW’s, with its torque focus, feels a little more reluctant to rev and feels swift when short-shifted. The 228i also orients its centre console shifter the driver-centric way – backwards for upshifts – while the Audi adopts the increasingly popular (though incorrect, in my book) forward-to-upshift motion. Both cars offer wheel-mounted paddleshifters and, frustratingly, neither will hold ratios without unwarranted self-shifting in manual modes. Get a sensible hustle on and both offer grin-inducing rather than frenzied pace, a point where claimed 6.3L (BMW) and 6.4L (Audi) combined fuel claims become fantasy. Even with large slices of urban and highway driving served during testing, figures were well into the nines. While BMW’s powertrain is certainly punchier around town, its chassis is more relaxed and comfort-focused in character. The suspension is softer set than the Audi’s and ride comfort is wonderfully impervious to hard-edged road imperfections despite the 18-inch run-flat tyres. The Audi’s is noticeably crisper in connection between driver and road surface, in everything from the tactility of the steering to vibrations felt up through the seat of the pants. It does ride firmer, though for such an unapologetically sporty model the suspension damping is nicely disciplined and compliant even by premium small car measures. Both offer comfort and refinement levels beyond your usual hot hatch fare. The TT’s inherent sportiness is ever present, regardless of how sedately it’s driven. And it’s really the steering, which is linear though neither hefty nor quick in ratio, and meatiness of its 245mm-wide tyres that are the major contributors. The BMW steers beautifully, though its narrower 225mm front rubber lacks the sort of front-end purchase that leaves its TT rival feeling like it’s hard-pinned to the road like Scalextric slot car. There’s little question that the TT’s quattro system adds some measure road-holding surety in adverse driving conditions. But in dry running, it’s the Audi’s grippy tyres and keen suspension tune doing the heavy lifting. And providing the more engaging drive at five- to eight-tenths pace. While the BMW’s rear-drive arrangement demonstrates virtually no handicap in lead-footed acceleration, its softer set chassis and slightly looser body control sees it relinquish its (modest) road-holding grip more quickly in corners. It’s certainly quick point to point, though it demands more circumspect driving and larger inputs to adjust its cornering attitude, and tends to tip into understeer without too much provocation. At the moderately quick twisty back-road clip most owners will likely exercise either German offering, the TT sits flatter, responds more eagerly, and rewards more without demanding race driver reflexes. The BMW’s great wring-its-neck party trick is, though, a little moot. Neither it or its Ingolstadt rival are marketed as high performers. In small track-friendly cars, there are fitter, faster and more-affordable options out there in Subaru STI, VW Golf R and Renault Megane RS, to name three. Audi’s own, vastly more-potent (210kW) S3 can had for $63,400. Or, well, 228i money. While the Audi is more accessible to a broader spectrum of driving skills, catering comprehensively to buyers in the luxury-sports end of the small car segment, it struggles to present a value argument. And while the TT quattro S tronic has the measure of the 228i on broad specification, its price is a mere couple of grand short of the mighty turbo-six M235i version. The TT does have some nifty little treats – the touch-dimming interior lights and the sonic ‘heartbeat’ on engine shutdown – though there are some glaring omissions at this pricepoint, such as a lack of a reversing camera (that said, the BMW’s camera is a $1000 option). Justifying Audi’s $13,550 premium, then, hinges on the TT’s polarising virtues: its design and technological flashiness. And polarise it does: one CarAdvice journo said the Audi would make the ideal daily driver, another said he wouldn’t be caught dead being seen in it. That 228i nary puts a tyre wrong in any area and offers a slightly more complete package for the premium small car buyer ultimately gives it nod in this comparison.